Welcome! Events are normally held on a monthly basis. Networking, gaining industry knowledge from experts and business educational knowledge to grow your business now! You're invited to celebrate with us! Please join your fellow IFDA members for the H.O.M.E benefit dinner on April 28th. Our Chapter has supported this charity for many years. We fill one or two tables at the dinner for our members, so it is a great way to connect while supporting a very worthwhile cause. If you wish to join us please rsvp to the Table Host, Tina Dann-Fenwick at tinadf@sbcglobal.net. She will register you for the event. Details are below. Please rsvp by April 16. We hope to see you there! Over the past 34 years, our friends, donors, board and staff have made a difference in the lives of thousands of older adults by helping them maintain their independence in their own homes and communities. Please join us for a special celebration of H.O.M.E. 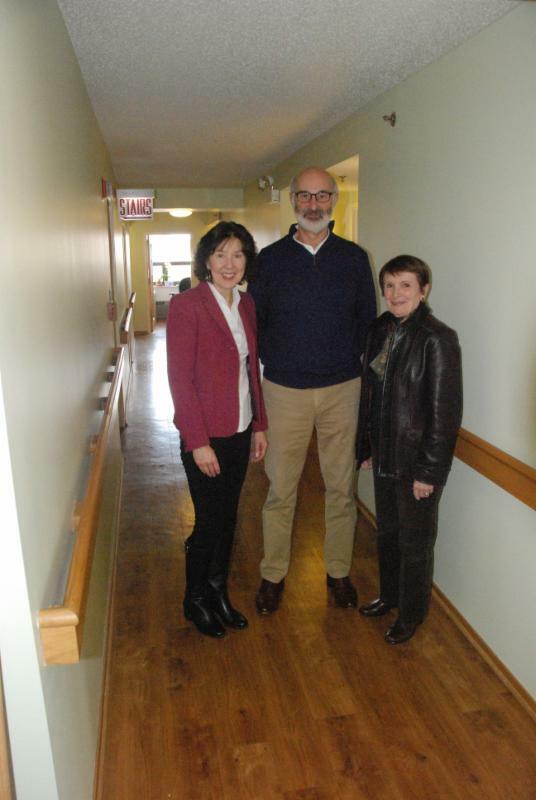 's many years of service to Chicago's low-income seniors. Honorees: Oak Street Health Dr. Memoona Hasnain, University of Illinois at Chicago Saint Clements Church Mistress of Ceremonies: Robyn Golden Director of Health and Aging at Rush University Medical Center Enjoy a complimentary dinner and reception provided by our sponsors at beautiful and historic Germania Place. There is no cost to attend, but an opportunity to support the work of H.O.M.E. through a financial contribution will be provided. Can't make it? Support H.O.M.E. 's work with a contribution. Visit www.homeseniors.org to see updates on Silent Auction items! H.O.M.E. MISSION STATEMENT H.O.M.E. helps low-income seniors in Chicago maintain their independence by providing home upkeep and repair, a shopping bus, moving assistance, and three affordable intergenerational buildings. The Best in Design Competition is back! The Illinois Chapter of IFDA is once again sponsoring a Best in Design Competition for its Chapter members. Any room installed in 2014 or 2015 is eligible. Submit your entry by March 31, 2016. Independent judges will review all submissions; and the winner will be announced at the Chapter's evening social in early May. The link below will take you to the details of the competition. I know our Chapter members are talented professionals, and I thank you for taking part in this Design Competition. A look into some of our events for 2015! The new board for the Illinois Chapter believes in making opportunities come true within our chapter; and our goal remains the same for 2015, to come together as a community of business professionals, to enjoy each other’s company, as well as to learn from professionals in our industry and from each other at the Presentations, Round Table discussions, new product offerings at showrooms (such as Honquest Finishes Arlington Heights and Prosource Buffalo Grove), and to enjoy our exciting IFDA/EF fundraiser event - attending the Steve Harvey show with a back stage tour following. Please join us for an informative and fun event with professional design photographer, Mike Kaskel. Mike will be instructing on how to improve your photos of your design work to better help showcase your business. We will be learning new and creative techniques that will take our portfolios to the next level. You don't want to miss this!! This event will be one you don't want to miss! We look forward to seeing you there! In that past the Illinois Chapter has held walking tours for the IFDA Educational Foundation Annual Fundraiser. We took in a dozen showrooms with their new product offerings in Chicago’s Merchandise Mart, or a variety of local artist showings in the Galleria District, or the hip Andersonville area with the antique and bohemian shops. This year the Chapter board decided to offer their members a unique outing: luncheon with colleagues followed by watching the taping of the Steve Harvey Show, followed by a “behind the scenes” look at what it takes to make a television show’s set successful. Join IFDA Illinois Chapter for a dynamic and informative event on how to improve your business in 2015. Start your new year out right and don't miss out on this great event! Want to know what else is in store for IFDA Illinois for 2015??? Below is our tentative schedule for the year. Exact dates will be given as events approach. We all have unlimited choices on materials, finishes, fabrics, and leathers for our furniture selections. The presenters, David and Roberta Honquest, for our mid-January chapter event brought to light new finish choices from metallic finishes of a sharuse technique to wood finishes, and glazes. Those who attended also learned how to care for the wood finishes and leathers, which finishes can be repaired and which cannot, and which finish looks better and gives depth to the piece. If you’d like to learn more about the topic, please come to the next event and we’ll share our notes with you! See you February 19th !! Join us for an educational presentation by David and Roberta Honquest as we explore the world of furniture finishes and discuss how to sell, care for, and maintain today's furniture! "There are so many exciting new finishes and materials in the market place today. From metallics wood finishes, glazed, to cerused techniques, acrylics, and hand blown glass. I will speak on how to incorporate these into your projects, and David will speak on how to care for, and service today's furniture." David Honquest is owner of Honquest Furniture Repair and Restoration, and Roberta Honquest is Outside Sales Representative for CAI Designs. We look forward to seeing you out for a great event! In the spirit of the holidays approaching, IFDA Illinois Chapter wanted to take a moment and highlight a cause we are very passionate about. For many years now, IFDA Illinois Chapter has partnered with an organization called H.O.M.E (Housing Opportunities & Maintenance for the Elderly). Our specific focus these past few years was on the Nathalie Salmon House in Roger's Park. What is Nathalie Salmon House? 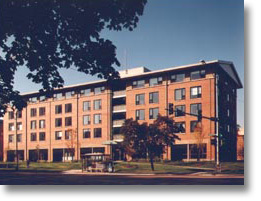 The Nathalie Salmon House opened in May 1994 and provides comfortable intergenerational living on each of its five floors. 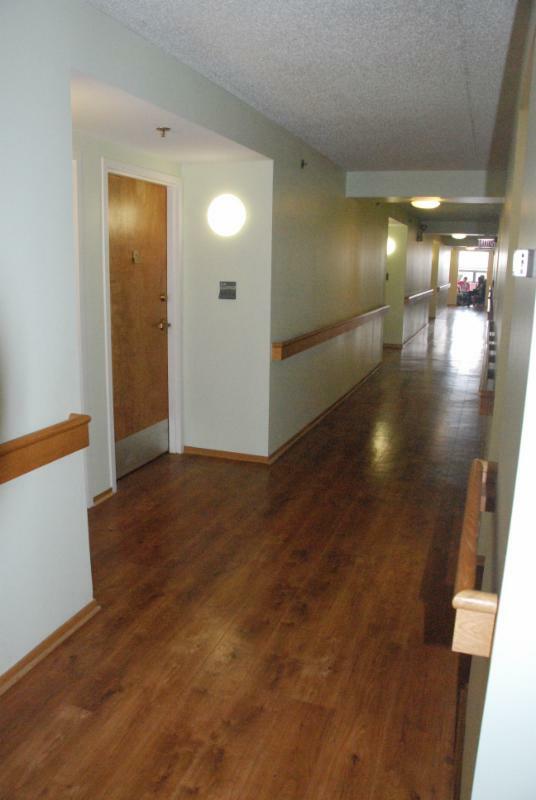 This 54-unit building is a fully handicapped accessible facility that accommodates 41 seniors, seven resident assistants, tho security monitors and four families. Pictured in the photo on the right is Bruce Otto and two of our IFDA Board Members. On the left is Tina Dann Fenwick, and on the right is Jean Addante. Both ladies co-chair the Vice President of Community Relations Position on the Board and were the IFDA representatives on the project. We are currently working on replacing the dated curtains in the shared dining room. We would love our members to take a few moments to see if you can donate any of the items on HOME's wishlist, see below. H.O.M.E. does not have the vehicles or staff to pick these items up so delivery or funds to hire a delivery or moving company would be most appreciated. If you do not have a means of transporting any of these items, please let Tina Dann-Fenwick (tinadf@sbcglobal.net) know and we will try to arrange delivery. WANT TO MAKE A NON-CASH DONATION TO H.O.M.E.? CLICK THE FOLLOWING LINK BELOW TO DONATE! IFDA is so excited about our partnership with HOME and we hope you are too! Don't wait to make your contribution to such a worthy cause! Please join us for drinks & appetizers to celebrate the winner of the 2014 Design Contest. The Winning Entry will be displayed along with all the entries. It's the perfect night for mingling and networking. The perfect time to join the IFDA! We hope to see everyone there! Pictures to come! We will spend the day together starting with lunch then visit designated shops in efforts to raise funds to help support the Educational Foundations's drive for scholarships and grants. 2. At 1:00 PM we will leave to do our walk. This should take us to 3:00 PM. We may try to fit in more shops if time allows. We look forward to a good turn out from everyone and for a good cause! Soft Design Master Lab with Deb Barrett and Jackie Von Tobel! This will be an intensive, full day .6 CEU accredited program that focuses on the high profit, soft furnishings market. Deb Barrett and Jackie Von Tobel will help you decipher the complicated ins and outs of this lucrative design segment so you can design, specify and deliver couture soft products to your clients. so you can flourish as a soft furnishings design pro. Deb and Jackie will not be offering this 6 hour accredited seminar again at this price. Your insights are valued and because this is an inaugural presentation, please stay after for a glass of wine and share your thoughts with us. We look forward to seeing you come out for a great day of learning and discussion! Stay tuned for the dates for the Focus Groups coming up in July 2014! A special thank you to everyone who made it out for our mid May social event! We celebrated the contestants in this year’s Design Competition, with a night at Cooper’s Hawk. All of the contestants displayed wonderful work, and a big congratulations to our winner, Penny Homsheid of Homsheid Interiors for her stunning Kitchen Remodel. It was a great night to take time away from our busy schedules to visit with other designers and to grow and strengthen our Illinois Chapter of IFDA. Here are some photo's from the night! Would you like to give back, help out for 1 hour, greet event attendees? 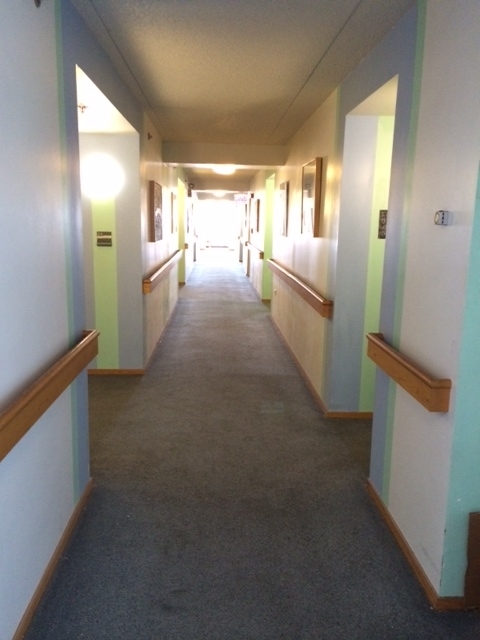 Contact Penny Homscheid... the group and getting to know people is a wonderful experience.